First, here a GIF which displays the distribution of GDPs for every year since 1995: the top and bottom 10%, as well as the 10-50% and the 50-90% fractiles. I’m getting a little bit tired of GIFs, and I’m showing below the most frequent category for each region over the period 1995-2010. Of course we only compare a handful of countries here, and those maps are only relevant because they illustrate the observations I have made in my previous post. 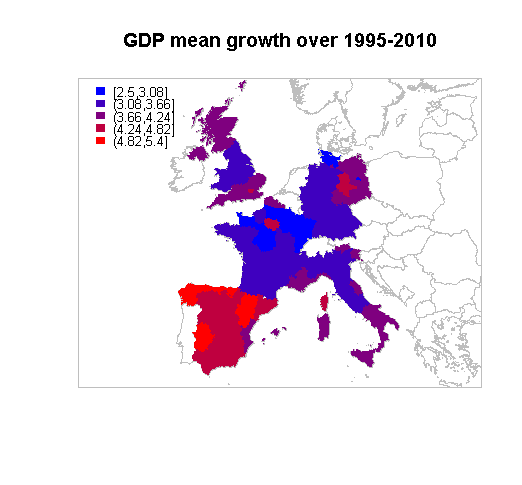 The map below shows the average growth rate in percent for the OECD countries in Europe, over the period 1996-2010 (DK has data from 2007 only, too bad). This entry was posted on March 18, 2014 by Rémi in Uncategorized.